Kicking off the New Year with some nice dark creations, 'Rhythm Distrikt' returns with its sixth edition in the long-standing techno series. Boasting an exclusive tracklist from some of the best techno DJs and producers on the circuit and gaining support from the likes of Carl Cox, 'Rhythm Distrikt 06' delivers another top selection of hard-hitting underground tracks. The album showcases the sounds of MiniCoolBoyz, Dataworx, Lutzenkirchen, Oscar L, Rafa Barrios & Christian Cambas whilst introducing Dosem, Heartik, Lowboys, Alex Costa & Antix into its ever-expanding family. 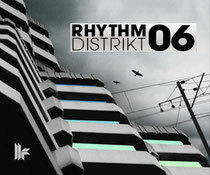 Delivering 20 new, exclusive tunes that should quench your thirst for previously undiscovered techno grooves, 'Rhythm Distrikt 06' adds another top edition to the Rhythm Distrikt repertoire.